Dunkin' Donuts has a new espresso beverage choice for 2017 - The Americano. The Americano is a permanent addition to its variety of premium, specially crafted coffees and espressos, joining a lineup that includes lattes, macchiatos, Cold Brew coffee and more. The Americano is served hot and combines two shots of Dunkin’ Donuts’ 100-percent Rainforest Alliance Certified espresso with hot water, creating a bold beverage with a rich, robust flavor. It's available at Dunkin' Donuts locations nationwide, including the 16 Kansas City-area locations. And let's not forget that Dunkin’ Donuts now offers hot tea – just in time for National Hot Tea Month, which is January. Kansas City-area restaurants and locations nationwide have several comforting choices for enjoying a hot cup with its selection of premium hot teas, available in five vibrant flavors. Served in pyramid tea sachets containing high-quality full leaf teas and herbal infusions for the optimal steep, the new premium hot tea lineup, introduced in November, offers both caffeinated and caffeine-free options, including Bold Breakfast Black™ Tea, Harmony Leaf Green™ Tea, Chamomile Fields™ Herbal Infusion, Hibiscus Kiss™ Herbal Infusion and Cool Mint Herbal Infusion. Guests may also purchase each flavor in boxes at Dunkin’ Donuts restaurants. Finally, one of our favorite apps – Dunkin’ Donuts DD Perks® – is kicking off 2017 with special offers for members ofthe brand’s rewards program. Throughout January, new members who enroll into DD Perks with the promo code NEWYEAR will earn triple points on purchases when they pay with their enrolled DD card. And, from Jan. 16 - 29, DD Perks members will receive 30 bonus points with each purchase of any size Americano. With the DD Perksrewards program, guests earn points towards free beverages with each purchase of Dunkin’ coffee, espressos, sandwiches and more. It’s easy to enroll in DD Perks and fun to use the rewarding DD app. For complete details about the program, visit www.DDPerks.com. Enter to WIN 2 $5 gift cards to try out the new Americano beverage, or any other item from the Dunkin' Donuts menu. 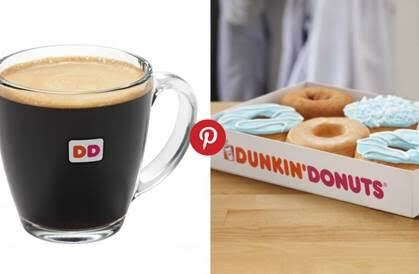 To enter, simply leave a comment telling us who you'd love to share your Dunkin' Donuts with! I would love to share with my mom. She's coming to visit and we haven't seen each other in years. Would love to catch up. I'd share with my kids. It's their fave! !